A column of British tanks has got involved in a car accident in northern Germany when a teenager crashed into a 62-ton Challenger 2. 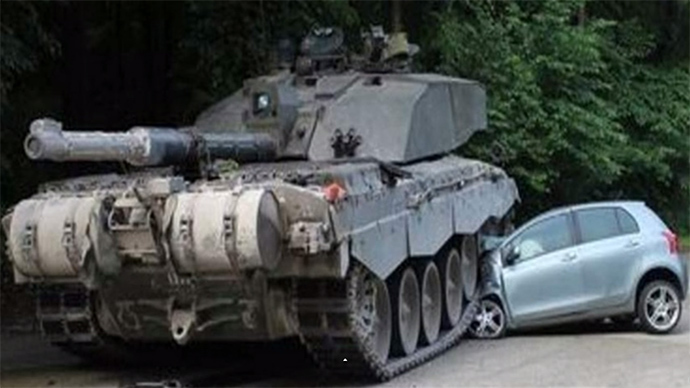 The tank had no way to avoid a collision, but did manage to save the life of the car’s young driver. The 18-year-old learner driver did not see the tank column as she tried to change lanes while driving in the small town of Augustdorf. Her mistake resulted in a collision with the Challenger 2. “The soldier had no chance to slow down,” a police spokesman told reporters. The British serviceman driving the tank was adjudged innocent of any wrongdoing by police. The 24-year-old soldier at the controls of the tank had no time to stop, but managed to turn so that he crushed the engine of the car, not the driver. Due to his actions a young woman, whose name has not been released under German privacy laws, was not even injured. Her car was not so lucky, however. The car’s bonnet was completely flattened by tracks of the tank. The damage is estimated at €12,000, or £8,500. The road where the accident happened is known as “Tank Ring Road” as it is widely used by tank convoys as a training area of British army which has two military bases there: at Herford and Paderborn, from where the tank in question came. This incident is not the first one connected with British tanks in Germany since the beginning of the year. On February, 10 another vehicle crashed into the front lawn of a private home in a residential in Paderborn. The soldier lost control of the tank after the problem with the tank’s tracks.